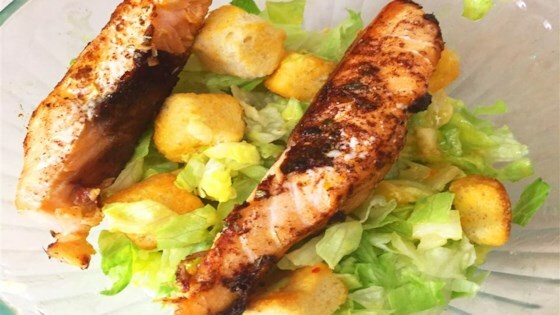 "A sweet-smoky, moist, oven-roasted salmon texture served on a bed of delicious and refreshing Caesar salad." Preheat the oven to 400 degrees F (200 degrees C). Line a baking pan with aluminum foil. Mix coconut sugar, paprika, orange zest, oregano, cinnamon, and sea salt together in a small bowl. Add 1 tablespoon olive oil and mix well. Rub salmon evenly with the mixture; place fish on the prepared baking pan. Roast in the preheated oven until fish flakes easily with a fork, about 15 minutes. Place lettuce in a bowl. Mix vinegar, 1 tablespoon olive oil, mustard, garlic, and salt together in a small bowl. Pour dressing over the lettuce and mix well. Add croutons and place the salmon on top.